What can you expect from a honeymoon in Malaysia, Thailand and Sri Lanka? That depends entirely on what you and your partner are looking for! So you've poured over the travel brochures, visited every tourist board's website, and digested numerous guidebooks. At last you have a short list of possible honeymoon destinations: Malaysia, Thailand and Sri Lanka - the question now is, how do you choose between them? Where Is It?Malaysia is in South East Asia, and forms a barrier between the Indian Ocean and the South China sea. Most holidaymakers or honeymooners fly into Sepang, its international airport, or arrive from Singapore or Thailand. Main cities include Kuala Lumpur, Melaka and Penang, and holidaymakers also head for the island of Borneo, which although Malaysian, is 300 miles away from the mainland. Malaysia's official language is Bahasa Malaysian. Is It For Me?If you like shopping, sightseeing and a fast pace of life, head for Kuala Lumpur, an eclectic city that sees skyscrapers set against a hilly forest back drop. For wildlife and heritage fanatics, try Borneo - it's wild and rugged jungles and landscapes are a sight to behold. Where is it?In the heart of South East Asia, and hugely popular with honeymooners and tourists from all over the globe, Thailand cannot be beaten as a destination! It attracts more visitors than any other country in South East Asia, and with its breathtaking scenery, unrivalled hospitality and places of interest, it's not hard to see why! Is it For Me?Thailand offers something for everyone, and honeymooners are most certainly no exception! Whether you wish to spend your stay visiting its national parks, its mountains, its temples or its beautiful beaches, you will not be disappointed! 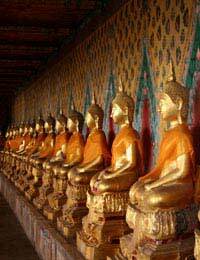 No trip to Thailand is complete without a visit to Bangkok, Thailand's cultural, political and commercial heartland. Where is It?Sri Lanka is a former British colony (formerly known as Ceylon) in the Indian Ocean off of the coast of Southern India. It is a tropical island and as such, has wet and dry seasons. For honeymooners it is an idyllic, beautiful destination steeped in history and surrounded by tropical forests. Is it For Me?Sri Lanka really does offer a diversity that makes it suitable for any visitors, be they honeymooners or family groups. Whether you want to relax on miles of white sandy beaches watching palms trees gently swaying in the warm breeze, visit the world renowned elephant orphanage at Pinnawela, experience Ratnapur, the extraordinary 'city of gems' or indeed shop for locally sourced (and made) gem stone jewellery, you will be completely spoiled for choice! Sri Lanka, Thailand and Malaysia are all very different countries offering very different experiences - whether you are a craving a honeymoon that gives you tranquillity and relaxation combined with the excitement of discovering wonderful new experiences, cultures and customs, all three destinations will offer just that. Making your final decision will not be easy, but what ever choice you make, it will be the right one!